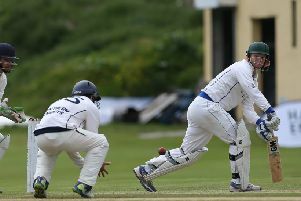 It’s the summer that keeps on giving as far as North West cricket is concerned and after a feast of Interprovincial cricket through the week, there was plenty of quality domestic action in glorious weather on Saturday. There is still no indication as to who the favourites for the title are likely to be and even less clarity surrounding the relegation dogfight. At the top, Donemana moved ominously into contention after their well-publicised poor start; Ricky-lee Dougherty’s men proving too hot for Ardmore to handle with centuries from Gary McClintock and Mal Cooray and another solid effort with the ball from Jordan McGonigle paving the way. That defeat leaves Gary Neely’s side at the bottom of the table for now and they’re being kept company down there by Brigade, who have now last all three of their most recent league matches. The two teams have a game against each other outstanding after that was postponed last Saturday and the match now takes on added significance. Brigade were undone this weekend by a Strabane side that continues to defy the odds. The Red Caps were pretty much everybody’s pick to go straight back down after they lost key players on the week the season started, however they have brought in Rachit Gaur and Chathura Peiris and they suddenly look a lot more solid. Aaron Gillespie’s 80 was the key here but again it was the all-round performance that only just saw Strabane come away with the points. Andy Britton threatened to pull his side out of trouble for the second week running as he made a superb 85 but it was to be all in vain as the visitors got that big wicket just in the nick of time to secure a huge win. Strabane’s story is being mirrored just down the road at Ballymagorry where Brian Allen is driving the Foxies away from danger too. The skipper was at it again on Saturday, keeping company with the prolific Cebo Tshiki as Fox Lodge chased down league leaders Coleraine who were missing a couple of key players for the clash. In the other remaining game Bready replaced the Bannsiders in pole position after a thoroughly convincing win at Eglinton. A century from Irosh Samarasooriya helped set up a very defendable target for the visitors and not for the first time this season, Bready’s quality attack took care of the rest. As with pretty much everyone else, the Magheramason men have slipped up when least expected this season but skipper Davy Scanlon will be well aware that a similar points’ haul in the second half of the summer could well see them heavily involved in the title race. Killyclooney seized the initiative in the Championship with a thumping win over previous leaders Glendermott that sent out a real statement of intent from Darren Moan’s team. The Rectory side were never at the races in their chase of ’Clooney’s 265-7; finally dismissed for just 78 in reply. 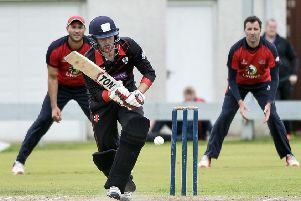 Burndennett recorded the day’s biggest win as they sent Bonds Glen to the bottom with a nine wicket hammering while St Johnston recorded valuable points as they saw off Newbuildings at the Boathole. The Saints are one of those “nearly” sides who are dogged by real inconsistency but there is a sense at the club that they aren’t all that far away. In the final game in this division Ballyspallen stayed very much in the hunt for promotion as they out-pointed Drummond in the Roe Valley.